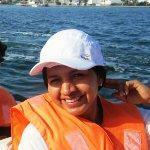 Nelida is Peruvian and professional tourist guide. Being in daily contact with French tourists for over ten years, she uses the French daily. This excellent command of the language of Molière allows him to understand the customer requests and respond accurately.